WeddingSutra Engage is an exclusive event that serves as a powerful platform for professionals in the weddings industry, and this time, some of the leading names who were present included Neha and Darshan Shroff from Momente Wedding Planners, Priti Sidhwani from Dreamzkraft, Sneha Tejwani and Anisha Bathija from Occasionz Unlimited. 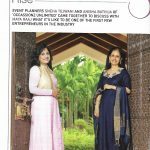 From executing a big, fat wedding in mere 25 days, to conceptualizing a close-knit one, Wedding Planners Sneha Tejwani and Anisha Bathija from Occasionz Unlimited have seen it all in their 15-year journey. The duo give us a few of their favorite wedding hacks in a freewheeling chat with WeddingSutra. Luxurious Oman is looking forward to hosting many more Indian weddings in 2015 and 2016. On Monday this week, Tourism Oman’s Mumbai office hosted an evening for select wedding planners and travel specialists. Among those present were Sushil Wadhwa of Platinum World Weddings, Purvi and Ajay Modgil of F5 Weddings, Sneha Tejwani and Anisha Bathija of Occasionz Unlimited and Manoj Gopalani of Var Vadhu.